Well, with it being Halloween and all, I thought I'd share something particularly horrific from my work on my coven: Mandrakes! 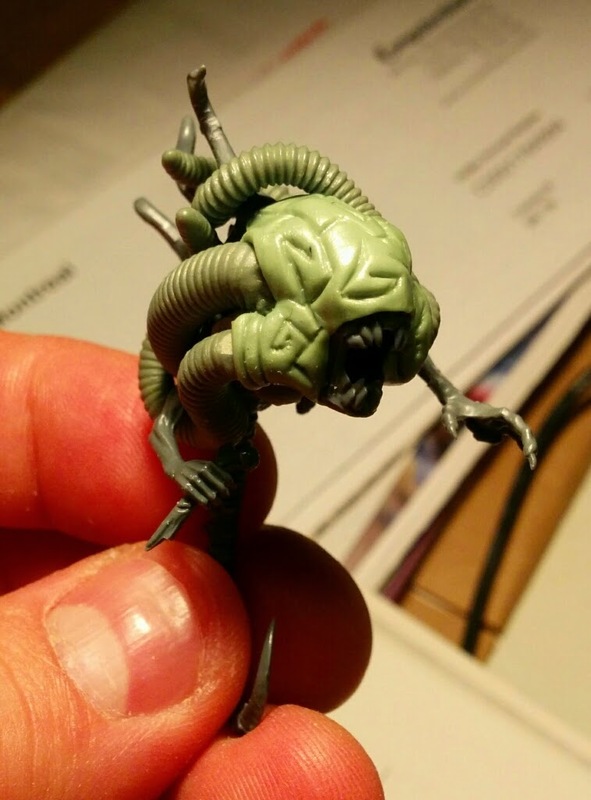 Once I'd found a suitably horrific solution for the Cronos, I had the itch to replicate this hideous treatment for Cronos parasites in other places in my army. I see the Cronos as kind of vacuums/generator for the whole coven. They are black holes into which souls/spirits pour, and they store the energy for the coven. I wanted them to have a pretty central role in the coven, so, if one gets destroyed, there needs to be a fresh supply of replacements. Enter the idea of including nascent parasites, which are being groomed and grown to one day assume their roles as full-fledged engines. When looking for a role that I could rep with a baby Cronos, the Mandrake was the most obvious ones for me, particularly now that they seem to be stealth DEATH machines with the new 'dex. In terms of construction, these parasites are mostly Pink Horror mouths and tentacles that have been built by a tentacle roller. Other bits include pink horror bodies (with legs removed), pink horror arms, ghoul arms (I tend to use them in mismatched sets to make the things more horrific and twisted), shirtless torsoes from either Crapachans or Marauders, and the all-important cronos tentacle tail/spine. You could probably replicate them with solely a Pink Horror kit, a tentacle roller, and cronos tentacles if you got em. I put in the Crapachan/Marauder torsoes to mimic the bare-chested look of the Cronos/Talos, and to link them to the MAN side of the drake lineage. However, these torsoes are mostly lost under the nest of tentacles. There was talk of making plasticard blades for them, but the reality is that I was too lazy and thought it more horrific that they could tear you apart with their maws, bare hands, and the occasional discarded bone fragment. I also sculpted on some arcane ruins carved into their skin to harken to that actual Mandrake models. That Mandrake is the one that's pretty close to done. The others pictured are still pretty WiP since they need to have some greenstuff fill-in done, then have their tentacles added with rune-carved flesh over top. In this unit you once again see how much I love the cavalry/bike bases for displaying cinematic scenes. When coming up with ideas for the Cronos Drakes, I seized on the codex fluff of Mandrakes emerging from people's shadows. I took an eldar victim, traced out his shadow on the base, and set to work trying to make the shadow look like it was swarming with tentacles from a Mandrake/Cronos that was pulling up out of the shadow. I'm not in love with this one. I feel like the carnifex maw was not as good, and the head is a little too large/bulbous, though I'll be trying to even it out with MOAR TENTACLES (this is the Tyranid version of MOAR SKULLS). In terms of painting, I'm hoping to give the appearance that they are glowing from within, with the deepest parts of them being bright white/blue, then their extremities being dark and black, like living nightmares or shadows. It's been tough so far, but I'll see if I can make it work. What do you folks think? Are they suitably nightmarish for things that go bump in the night? Any tips on how to reverse-highlight a model, making the recesses brightest and the extremities darkest? These are unbelievably fantastic. I totally missed your chronos as well...fantastic. Perfect post for halloween too. 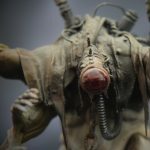 Reverse highlighting a model...maybe a style of "reverse washing" Thin your paint, put it in the recesses, then wipe it off with a rag or finger, leaving it just remaining in the recess. It's hard to get really fine highlights that way though. If you want an easy glow though, check out secret weapons "fallout" wash. Thanks Greg! I'm pretty happy with them, and I'm eager to share the rest of them, all betentacled. I think your tip about washing and wiping will work best. The fallout wash looks good, but I'm hoping to have it be a blue glow, rather than a green. Hmm, I haven't looked at their blue washes. I just know the fallout stuff is crazy bright. You could always make your own light blue wash with some medium and water. Make sure to test on a model that isn't so beautifully sculpted first! Marvelous Mr. Pink. You have made me want to sculpt again. Anon: That is one of my favourite things to hear. More people need to be sculpting!! !